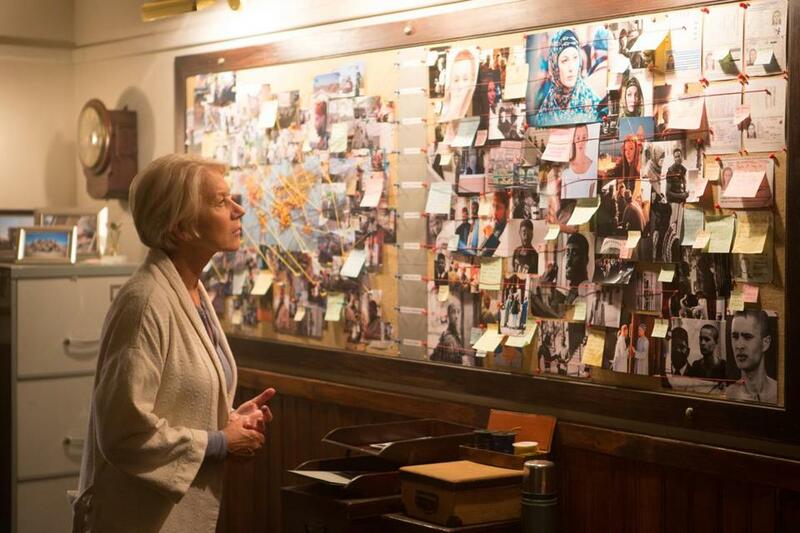 “Eye in the Sky” is both a white-knuckle suspense film and a freshman ethics seminar — and there will be a quiz. Actually, the movie itself is the quiz. Its strength and limitation is that it’s a gimmick that works. The film’s also a drone-warfare drama, but not an agonized character piece, like 2014’s “Good Kill,” in which Ethan Hawke in Nevada pushed buttons that obliterated people in Afghanistan. Instead, director Gavin Hood (“Tsotsi,” “Rendition”), working from a jigsaw-puzzle script by Guy Hibbert, puts the audience in a dramatic vise where everyone — including the characters and ourselves — has to decide whether saving theoretical lives justifies causing the death of an actual innocent. Helen Mirren at her most enjoyably cold-blooded plays Colonel Katherine Powell, sitting in an underground bunker somewhere in England while leading an anti-terrorist team in Nairobi from her catbird seat. Two young jihadists, one a US citizen, have arrived to meet with a local al-Shabaab cell, and the sitdown may include a radicalized Englishwoman (Lex King) who has been Powell’s quarry for years. On the ground in Nairobi is a team of Kenyan agents led by the resourceful Jama (Barkhad Abdi, the pirate leader of “Captain Phillips”), who has at his disposal a tiny, not-at-all-creepy beetle-shaped spycam that can fly into houses and that actually exists. Powell’s “eyes in the sky” above the terrorist’s house is a US drone piloted from Nevada by Lieutenants Watts (Aaron Paul, of “Breaking Bad”) and Gershon (Phoebe Fox), the latter a nervous newbie. A military specialist (Kim Engelbrecht) in Hawaii is on hand to ID the suspects through facial telemetry. Oh, and there’s a London conference room full of high-ranking military personnel and government ministers who are supposedly overseeing the entire operation but who are soon dragged into a moral quagmire that renders them, more or less, six angry men and women. The problem is this: The beetle-cam reveals preparations for an imminent terrorist attack along the lines of the Nairobi shopping mall bombing in September 2013. And in the bustling street just outside the house’s walls a little girl (Aisha Takow) has set up a table to sell bread. Would you push a button to send a Hellfire missile through the terrorists’ roof and kill the girl? What are the repercussions in terms of politics, international law, simple humanity? As Powell’s bunker crew frantically calculates Collateral Damage Estimates — a statistic that, like all statistics, can be bent to mean whatever you wish — the higher-ups in the conference room argue, stall, dither, and, in classic bureaucratic tradition, “refer up” the chain of command to cover their, uh, decisions. “Eye in the Sky” cuts continually to the shifting situation in Nairobi, with Jama risking his life to get the girl to safety, and it flashes as well to the US drone team with Watts’s finger literally on the trigger of an untenable situation. Hood drops in on the British foreign minister (Iain Glen, of “Game of Thrones”), suffering from food poisoning in Hong Kong, as well as a few US political higher-ups who basically say, what’s the problem, drop the hammer. But the heart of the matter is in that conference room, where the leading military mind is played by Alan Rickman. The movie is a final chance to remind ourselves how blessed we were to have had Rickman with us as long as we did; the late actor has one more voice role in the can (in Tim Burton’s upcoming “Alice Through the Looking Glass”), but his role as Lieutenant General Frank Benson was his last on-screen performance before his death in February. Rickman alone seems to understand that the movie’s war-room arguments are this close to “Dr. Strangelove”-level farce, except more bleakly, awfully comic because they’re potentially real. The general is a military man of the world, glaring balefully at the craven ministers played by Jeremy Northam, Richard McCabe, and Monica Dolan, not because they’re concerned about the young girl’s life but because they’re incapable of making a decision. Well, could you? Hibbert’s screenplay threatens to talk every nuance to death, including the sensible fact that dropping bombs on innocent people tends to create more terrorists. But “Eye in the Sky” moves fast enough to keep us rapt and rattled, and it plays fair by most of its characters, including the girl’s parents (Faissa Hassan and Armaan Haggio), a baker and a bicycle repairman who see quietly to her education beneath the radar of the al-Shabaab militiamen. The girl, Aila, is a girl, which is to say the script humanizes her enough so that we care very much about what happens to her. It’s clockwork entertainment, in the end — a precisely calibrated schematic in which every aspect of the ethical quandary balances every other aspect, and the only variable is your own moral compass. “Eye in the Sky” resolves itself logically and, I think, honorably, but it’s so invested in its own interlocking cogs that the larger picture — of our brave new world of surveillance, drone strikes, and decentralized warfare — seems almost taken for granted. As suspense, it’s excellent. The audience doesn’t breathe for nearly two hours. But neither does the movie. Directed by Gavin Hood. Written by Guy Hibbert. Starring Helen Mirren, Alan Rickman, Aisha Takow, Barkhad Abdi, Aaron Paul, Jeremy Northam, Iain Glen. At Kendall Square, Coolidge Corner, Boston Common; West Newton on March 25. 102 minutes. R (violent images and language).